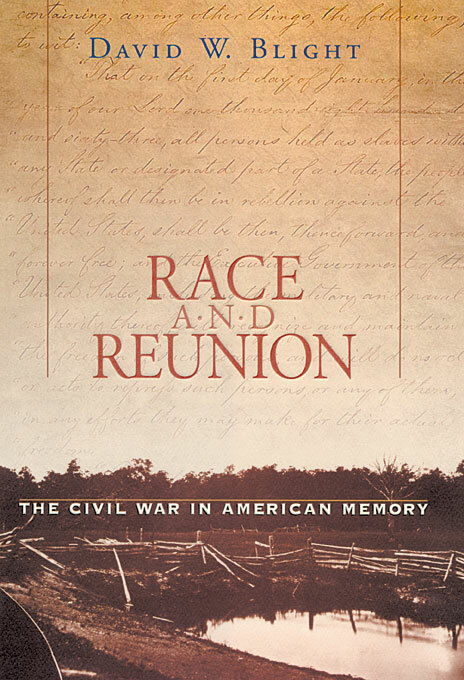 Race and Reunion: The Civil War in American Memory. By David W. Blight. Cambridge, MA: Harvard University Press, 2001. One of the most powerful elements of historical study in the last thirty years is the nature of memory. The analysis of how stories about the past become a master narrative, and what lessons they teach those interested in the subject, has been a growing area of concern in American history. This memory is constructed gradually over time as people reflect on the meaning of what has transpired, and much of what emerges is not so much a fable or falsehood as it is a kind of poetry about events and situations that have great significance for the people involved. The memories over time become more significant than the cold, hard facts of the past, insofar as they are recoverable at all, and become the essential truths of the past for the members of a cultural group who hold them, enact them, or perceive them. But what does it say about a society in which the falsification of memory is overt, as David Blight suggests in this elegant depiction of the past? David Blight’s Race and Reunion is a stunning analysis of the manner in which a specific master narrative about the Civil War was constructed through its memory in American consciousness. He starts his book with a discussion of the fiftieth anniversary of the battle of Gettysburg in 1913, and how the theme of reconciliation and shared valor were emphasized rather than the divisive issues of slavery, human rights, and treason that the war was really about. He asked the pointed question: “What had the 50 years since the battle meant?” (p. 11). The answer, Blight finds, is that the reasons for the war—the prohibition of slavery beyond the borders where it already existed, the morality of owning another human being, and the nature of human dignity and rights, treason, and armed rebellion—had been consciously recast as a “war between the states” in which the fundamental divisions were over fine points of constitutional law. In the process the welfare of former slaves had been abandoned, restrictive laws had emerged to control the African American population, and the race issue in the United States—still one of the most difficult issues of the nation—was ignored in favor of white reconciliation and sectional harmony. With considerable eloquence and not a little bitterness Blight goes on to trace the rise of a pro-Southern master narrative that ignored racism, and its manifestation in slavery, as the REASON behind the war. As he does so his anger manifests itself, and I found his indignation a moving force in Race and Reunion. He rightly concludes that this stolen memory of the reasons for this “strange, sad war” represents a true malignancy on the soul of America. Notwithstanding some, such as Frederick Douglass, William Tecumseh Sherman, and U.S. Grant, who sought to keep alive the spirit of reform that the war bespoke, a wellspring of pro-Southern sentiment calculated to alter the memory of the war among most Americans reinterpreted this great reform effort. The valor of the southern soldier. The stability and tranquility of the culture of the Old South with happy and fulfilled participants whether slave or free. The Southern past must be defended and celebrated against all alternative constructions that were by definition prejudiced and malevolent. The causes of the war revolved around constitutional issues and northern harassment of those legal positions, violating Southern states’ autonomy. Moreover, the war had virtually nothing to do with the institution of slavery. Slavery may have existed in the Old South, but it had been a benign institution in which those who participated in it lived fulfilling and peaceful lives. Throughout Race and Reunion Blight notes the consistent theme of white supremacy that motivated the creation of this memory of the Civil War. Perhaps it is not difficult to believe that former Confederates would assert these arguments to justify their actions. What is perplexing, however, is the ease with which Northerners, including many participants in the war, accepted this as the master narrative of the war. Most were motivated by self-interest in commerce and industrialization, never questioning that some things might be more important and that not to understand and act on them make us less than we should ever allow ourselves to become. In the end, Northerners easily pardoned themselves for abandoning the freed slaves by noting that the ending of chattel slavery was enough; never mind its replacement with restrictive Jim Crow laws and forms of economic slavery. Reunion and reconciliation at any price was better than on-going conflict. Moreover, and Blight suggests as much, did the North capitulate to the “Lost Cause” reinterpretation of the Civil War because it was as racist as the South? Did the people recollecting the war miss the point of it all, and if so was it intentional? No question, racism is still with us in this country, and manifestations of it appear to be on the upsurge. Attitudes of disdain and calls for curbing of civil liberties based on little more than race and ethnicity abound in the America of the early twenty-first century. What does the unfinished journey somberly chronicled in David Blight’s Race and Reunion signal for the future? This entry was posted in History, Politics and tagged abolition of slavery, civil war, Confederates, David W. Blight, Frederick Douglass, Gettysburg, Harvard University Press, Jefferson Davis, Jim Crow, Lost Cause, memory, Race and Reunion: The Civil War in American Memory, racism, Reconstruction, reunion, slavery, state's rights, U.S. Grant, William Tecumseh Sherman. Bookmark the permalink.